As ways of ingratiating one's brewery with a journalist writing about beer, dipping the top of a bottle you plan to present to them half a dozen or more times in wax – laughing while doing so at the impending battle said journalist will face getting into the beer – is an unusual one. 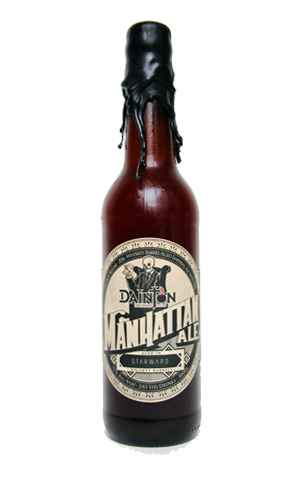 Still, it was very good of Dainton Family Brewery to sneak us a bottle of its new Manhattan Ale, even if the resultant battle took up 20 minutes. Perhaps the brewery team was that convinced of the quality of the liquid inside they figured the effort would be more than worth it. Although, knowing the characters at play, it's far more likely they just found the whole escapade hilarious. Anyway, what is it? Originally the Manhattan Ale was a joint venture with The Everleigh that aimed to recreate the classic cocktail of the same name in beer form. Now, flying solo, Dainton sees the Manhattan become its annual fancy as flagship release (hence the wax seal as well as a rather flash label). This year's vintage starts out with a nigh on 10 percent Belgian Abbey style ale featuring plenty of rye, which was then aged in ex-Starward whisky barrels that themselves once housed Pedro Ximenez. The beer spent six months inside oak and has picked up plenty of character from that time. The barrels lend the beer a drying woody quality, while the fruitiness and spiciness of the base beer – plus a touch of whisky juiciness – comes through as it warms. The Daintons say it's a beer designed to stand up to careful ageing too, and presumably they mean more than the time it takes to hack your way inside.